At the beginning of the year, as we are setting up our Google Classrooms, OneNote Notebooks, and Email distribution lists, we can also think about other ways to communicate with parents and students. The following two means, allow third party texting with parents and students, but NO ONE knows each other's phone number. Remind - A communication tool that provides a safe way for teachers to text message or email students and parents. Bloomz - With Bloomz, teachers can safely communicate with parents, share class photos & updates, and coordinate through volunteer and conference signups. Did you know that parents can now get summaries of students work in Google Classroom? You can also categorize your assignments, announcements and questions by Topic! 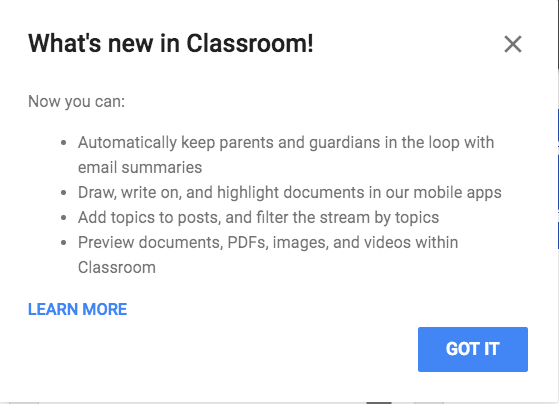 Here are just a few of the new changes in Google Classroom and a walk through of how to add parent email addresses, what parents will see and how to categorize your assignments, announcements and questions into Topics! If it's been a while since you have used Forms, you may have noticed two major changes. 1. Now you can GRADE quizzes directly in the Form!! NO NEED FOR FLUBAROO!! 2. You can now insert images into questions and answers! !